Boy Scout Troop 50 | Chattahoochee Council | Auburn, Ala. | #troop50: Take shelter! Troop 50 took shelter this past weekend at the Forest Ecology Preserve, where Scouts developed and put into practice the wilderness survival skills they learned during the past two troop meetings. As a result of their work, Scouts attending the campout earned the Wilderness Survival Merit Badge. This was also the troop’s inaugural campout, which gave them a chance to check out troop gear and begin working together in their patrols and as a troop-team. 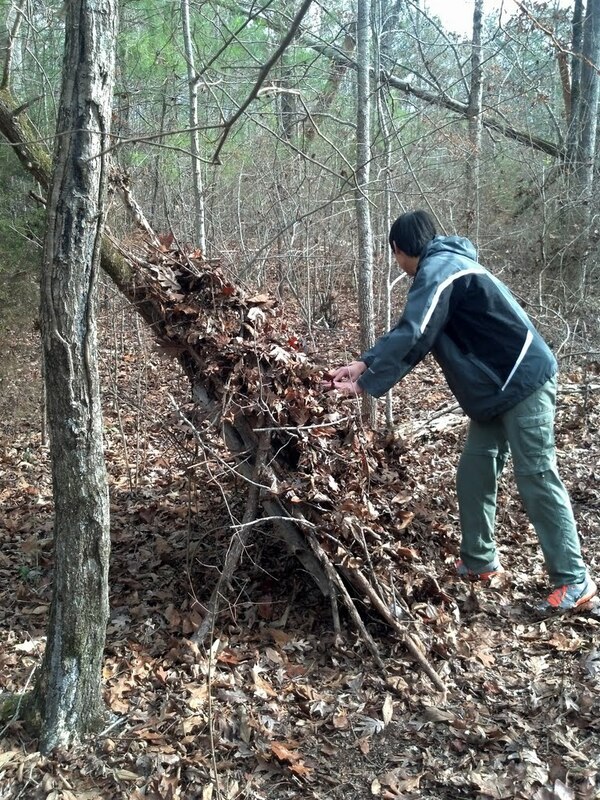 After creating their shelters, which included a combination of natural and fabricated materials, the troop’s youth leadership led sessions on fire building, orienteering and signaling. Our two patrols competed in a map-reading and orienteering course, with the final bearing leading to a gravity-fed shower for each patrol's future use. and Josh with their gravity shower prize. On Sunday, the troop held a Scouts’ Own service, where Scouts and leaders focused on how being equipped is important, whether it is being equipped for Scouts, sports or their spiritual life. The troop then conducted a service project for the preserve – exercising Scouting’s “Leave No Trace” principles by removing the traces of blazed trails and improper fire pits created without the preserve’s consent. Robert with their gravity shower prize. In its Patrol Leaders Council the following Monday evening, youth leaders praised the fun everyone had, noted the shelters held up well, and the compass course was a good time. They also thought rotating troop cooking and cleaning among patrols worked well and spread the load among everyone. They also agreed that more orienteering practice would be helpful.